Zheng Guizhen, Zheng Mengzhu's mother. 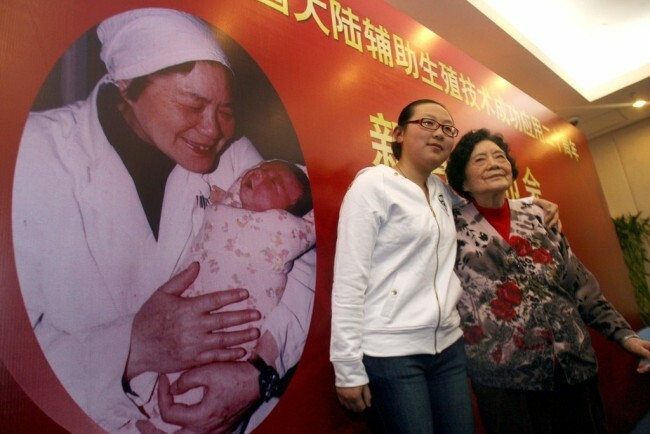 Zheng Mengzhu, the first test-tube baby in mainland China, was born at 8:56 am, March 10, 1988. Zheng weighed 3,900 grams. Zheng Mengzhu, left, seen in February 2008, with Zhang Lizhu, the doctor who delivered her. Zheng Mengzhu, the Chinese mainland's first test-tube baby, gave birth to a child in the morning today, according to the Peking University Third Hospital, Xinhua reports. 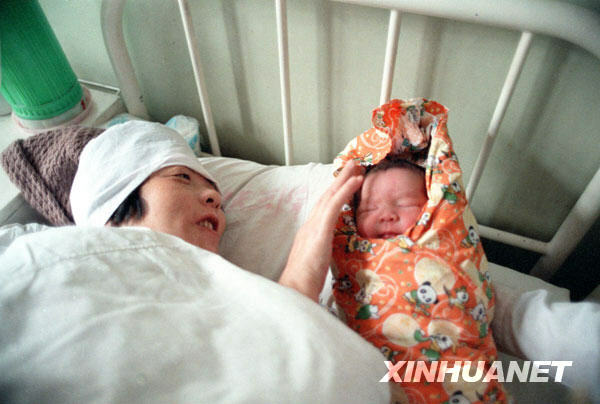 Zheng gave birth to a boy on 8:34 a.m. today through a cesarean section, said Zhao Yangyu, a doctor who performed the surgery. The boy weighed 3,850 grams. The baby was in a horizontal position when he was in the womb, a situation that demanded a C-section, Zhao said. "The surgery went rather well. Both the mother and the baby are in stable condition," she said. Back in 1988, Zheng Mengzhu, became the first test-tube baby in mainland China, when she was born at 8:56 am, on March 10. Zheng weighed 3,900 grams, and was 52 centimeters long. This test-tube baby project was co-operated and completed by Professor Zhang Lizhu, an obstetrics and gynecology expert who was in charge of reproduction engineering of Peking University (Health Sciences) and her partner assistant professor Liu Bin.